Join us Saturday, August 4th for our Property Dedication. Property Description: Located off of Route 41 in Mount Vernon, the Ezra Smith Wildlife Conservation Area will be managed to protect wildlife habitat and water quality, for low impact outdoor recreation, and as a sustainable forestry demonstration site. The eastern boundary of the property is close to the beautiful, largely undeveloped Hopkins Stream corridor. 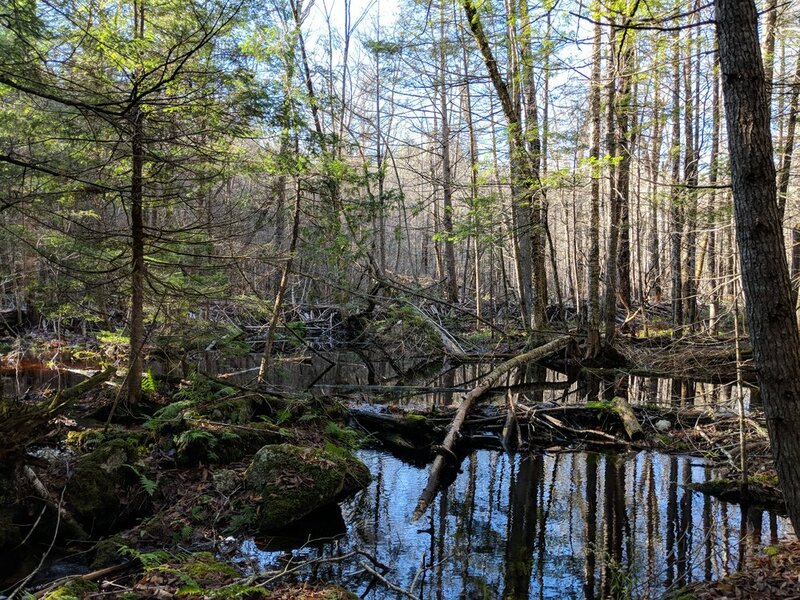 The 125 acre hilly property conserves a 50 acre wetland with a large vernal pool, a well-managed mixed hardwood-conifer forest, and a deer wintering area. The interior of the property and parts of Hopkins Stream are identified as Resource Protection Areas in the Mount Vernon’s Comprehensive Plan. The extensive undeveloped uplands and wetlands along the Hopkins stream corridor provide important wildlife habitat for ducks and wading birds. Allowable Uses: hiking, nature observation, snowshoeing, hunting. No motorized vehicles. Directions: A small sign for the Ezra Smith Conservation Area is present on the East side of Route 41 in Mount Vernon, adjacent to a cemetery. The property is about half a mile South of Blake Hill Road. Please be careful on Route 41-vehicles travel at a high speed. Trails: At this time there are no established trails or a parking area. KLT plans to build trails in Summer 2018.